Storm Shield Defense Missions are apart of what is known as the Save The World Mode found in Fortnite. 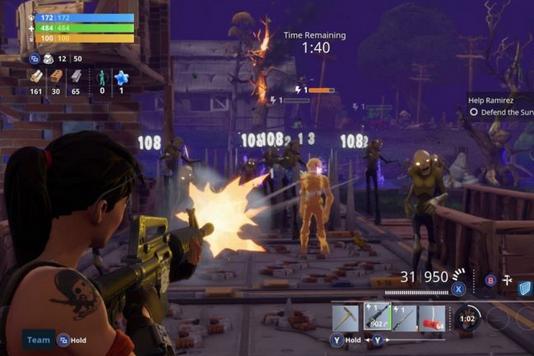 Unlike the Battle Royale, Storm Shield Defense Missions play a more connected role to the overall theme of Fortnite, the same where the story revolves around defeating the zombified creatures left after the storm destroyed most of humanity. Storm Shield Defense Missions are indicated by a number of different locations dotted around the main Map, and they vary from one to the next, especially from one location to the next. But be warned, unless your characters at a certain level, some of these missions will be impossible to complete. As mentioned, your Storm Shield Defense Missions will take place in a number of different locations around the Map, four to be exact. These locations include StoneWood, Canny Valley, Plankerton and Twin Peaks. Each location will see you having to complete varies task from one mission to the next - with each location including roughly five to six missions to complete - being rewarded with V-Bucks (among other things) should you complete each of them. You can face these missions in any order you would so please; however, since each have a recommend Level Requirement, it's best to start at StoneWood and work your way in order. The Level Requirement doesn't mean you can't attempt to complete one of the missions, but most are impossible to defeat unless you're at said level.